Apart from Menotti’s Amahl and the Night Visitors, which is a perennial Christmas favourite, his other works are given fairly short shrift both on the stage and on disk. Thus one may be considered fortunate indeed to be offered no less than two different productions of his works during the current year, and even more so with the first of these – from Juventus Lyrica – being a double bill of his first two operas, Amelia al ballo and The Old Maid and the Thief. Though only two years separate them, they are quite different works. Amelia is opera buffa while The Old Maid is not, Amelia is Italianate in style while The Old Maid has an American feel, and of course Amelia is in Italian while The Old Maid is in English. Perhaps because they were in the hands of different producers– with Florencia Sanguinetti responsible for Amelia and Juventus co-founder Ana D’Anna for The Old Maid – these details were nicely contrasted, with the two productions as different as they are stylistically, with Amelia lush and “period” and The Old Maid starker and more simple. So first Amelia, the setting Amelia’s room as luxurious as one may expect and where, her only interest going to the season’s opening ball, she has to remonstrate with her husband then her lover, before finally sending him off to jail and leaving for the ball with the chief of police. 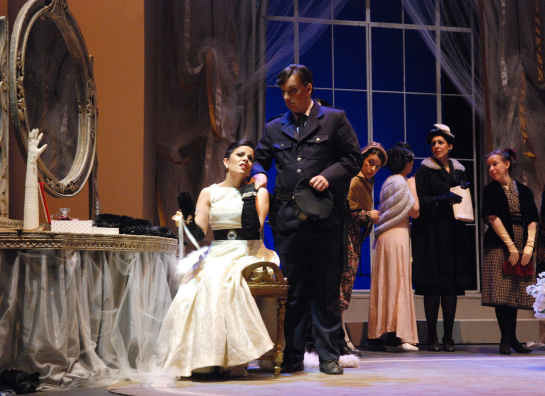 Eleonora Sancho was an amusingly coquettish Amelia to a suitably jealous Gustavo Feulién as her husband and ardent Norberto Fernández as her lover, while Pablo Basualdo was a suave chief of police. The Old Maid and the Thief: Laura Penchi (Laetita) and Eugenia Fuente (Miss Todd) with Sebastián Sorarrain (Bob) “upstairs”. In contrast The Old Maid was set on two levels, the lower Miss Todd’s (the old maid) sitting room and the upper the room that is occupied by Bob (the “thief”) after he is persuaded to stay. 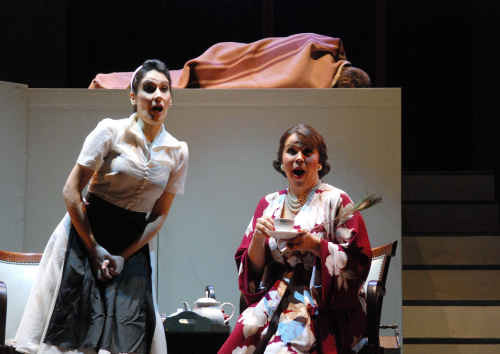 Eugenia Fuente as Miss Todd and Vanesa Thomas as her neighbour were a delightful pair of chattering spinsters, while Laura Penchi as the maid Laetita was as mischievous as ever and Sebastián Sorarrain was an uneasy Bob. In both works all played their parts well but some looked just too young for their parts and of course in some cases the vocal immaturity also showed. But as the woman in the next seat said to me at interval, young singers need an opportunity to perform and they need to be supported. In this light, and with the support of the thoroughly enthusiastic playing of the orchestra under music lecturer and composer Leandro Valiente, these two productions were worthy indeed.